Here is a somewhat different notion of what has usually been regarded as travel photography. Not at all meant to supplant, but just to augment. It’s my way of delving somewhat into the culture. I’ve done this before with images in South Asia and Europe. I was heading home after a very demanding three weeks of leading a photographic tour in Nepal and India. I stopped in Japan for a couple of days of rest before the flight to San Francisco. 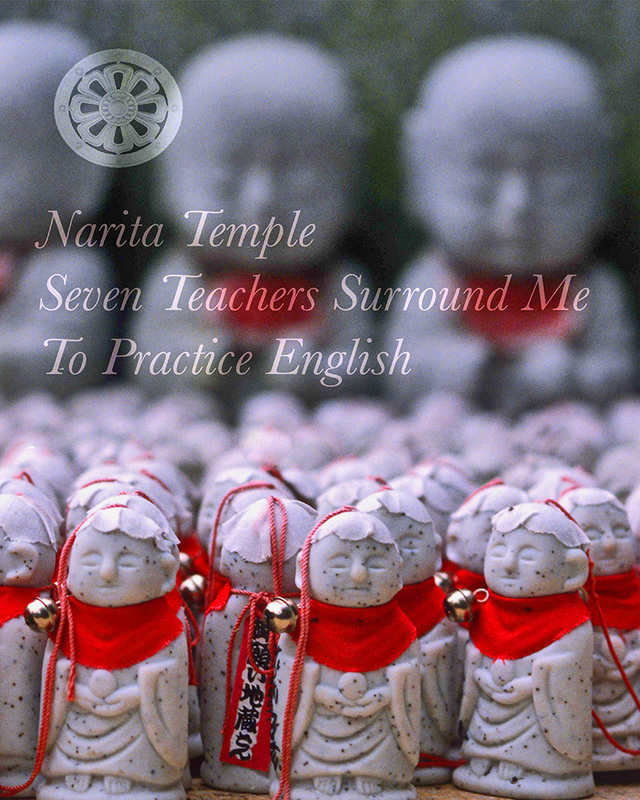 Limiting my wanderings to the immediate area of the ancient Narita Temple, I was at one time the object of curiosity of seven Japanese schoolteachers of English. For an hour or more we practiced English phrases. They were most charming, and if I’d had longer, would have volunteered to meet them at their schools. All these many years later, I wanted to make a single image which would represent that experience. Using the syllabic distribution of haiku lines, 5-7-5, I composed my haiku and placed it over miniature Japanese Buddha figurines for sale near the temple, the largest of which are deliberately and conveniently out of focus. The lotus medallion in the upper left is from my photograph of the brass handles on the front of the thousand-year-old Narita Temple.